The 10,000-square-foot, Texas inspired food venue is finally open. What was once formerly known as Hill County Hospitality’s Brooklyn location has been transformed into a fun, casual and multi-concept food hall at 345 Adams Street. Hill County is known for their Southern BBQ focus but the new idea for the food hall renovation, which was inspired by the Austin food truck scene, is featuring all types of gourmet style food, from home style BBQ to Italian, to specialty deserts. Six food stalls which include, Bluebonnets, Hill Country BBQ Market, South Congress, Hill Country Chicken, Austino’s and Nickie’s are serving everything from artisanal coffee, handmade donuts, and breakfast tacos in the morning and fried chicken, burgers, house-made tortillas and tacos, pizza slices, salads and more later on in the day. Looking for more? 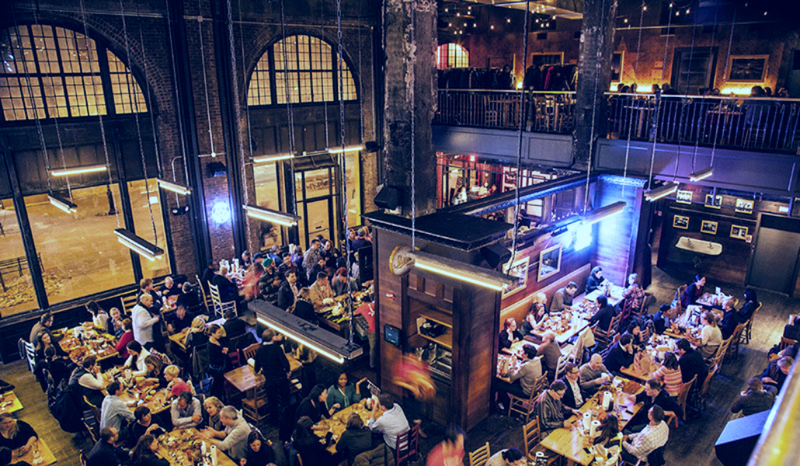 Check out this list of ten other spectacular food halls in NYC.